ACHOO! Does This Mean I Have Allergic Rhinitis? 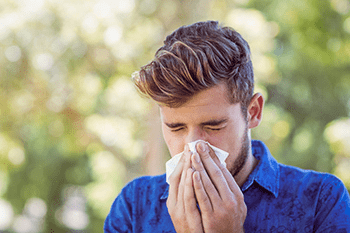 When it occurs during the spring, summer, and early fall, allergic rhinitis is typically known as seasonal “hay fever” and is commonly triggered by pollens from ragweed, grasses and certain trees. It’s also possible to have allergic rhinitis all year round when it is triggered by indoor allergens like dust mites, indoor molds or pets. Respiratory allergies are often poorly managed and ineffectively treated. Your symptoms can become worse over time if you don’t get the correct treatment for your situation. Also, allergic rhinitis can be a major risk factor for developing asthma or chronic sinusitis. It’s important to have the right diagnosis in the beginning regarding your allergy symptoms, and then, a careful assessment of your needs and lifestyle to find the best treatment for you. Treatment choices can include avoidance of the allergen, medications to lessen your symptoms, and allergy immunotherapy. If you could avoid being exposed to your trigger allergens, you could avoid the allergy symptoms. However, complete avoidance is seldom practical in today’s world even if it is possible. Treating allergic rhinitis with medications that lessen your symptoms can help, but they are never a permanent solution. You will continue to develop symptoms whenever you are exposed to your allergy triggers. Allergy Immunotherapy Resets Your Immune Response! Allergy immunotherapy can play a crucial role in the overall treatment of allergic rhinitis. The purpose of the immunotherapy approach is to increase the tolerance of your immune system for exposure to your allergy triggers. It works by systematically treating you with small amounts of allergens which gradually increase in strength. As treatment continues, your immune system becomes desensitized to your trigger substances, and you have less and less symptoms. Complete desensitization is the goal. It’s a gradual process that means your symptoms will diminish, if not disappear, as treatment progresses. And this change is long-term, not temporary. You Now Have a New and Convenient Choice for Allergy Immunotherapy! Sublingual immunotherapy (SLIT) is here in tablet form. Dr. Silberman and the Cleveland Sinus Institute are proud to offer you an immunotherapy tablet for three of the most prominent triggers that cause allergic rhinitis. The tablet form of allergy immunotherapy has already been in use in Europe, and now, the FDA has recently approved these new tablets for use in the USA. Your Allergy Remedies are Here! RAGWITEK® (RAG-wi-tek) for ragweed allergy.2 Treating ragweed allergy just got a little easier with a little tablet you can place under your tongue. RAGWITEK® is not a medication that gives temporary relief for symptoms of ragweed allergy. Instead, it is clinically proven to help prevent ragweed allergy symptoms by desensitizing your immune system over time. You begin treatment about 12 weeks before ragweed pollen season begins and continue therapy until it ends. It may be prescribed for ragweed allergy sufferers from ages 18 through 65. GRASTEK® for Timothy grass allergy. 1 You can now treat your Timothy grass allergy with a tablet that you place under your tongue. GRASTEK is the only allergy immunotherapy tablet approved for kids as young as 5 years of age with grass allergies. It’s also recommended for adults up to age 65. ODACTRA™ for dust mite allergy. 3 Because ODACTRA™ works to treat the underlying sensitivity of your immune system, it can help decrease your need for symptom-reducing medications like antihistamines and nasal sprays. It’s a small tablet that you place under your tongue, so there’s no need for trips to the doctor for shots. ODACTRA is approved for use in adults ages18 through 65. It’s practically impossible to avoid dust mites. They are everywhere in your indoor environment, all year long. Dust mites are present at work, at home, and particularly in the bedroom. If you suffer from dust mite allergy, you will find it hard to escape its symptoms. Even when you go outdoors, the inflammation and other symptoms caused by your allergy to dust mites will go with you. Sublingual allergy immunotherapy tablets are the injection-free treatment that doesn’t just cover up your symptoms. They actually fight your symptoms by working with your immune system. You can administer SLIT tablets conveniently at home. No more shots, no more taking time off work and school for trips to the doctor to get treatment. It’s simple and easy allergy treatment for kids and adults. This new allergy immunotherapy option can be so helpful in today’s busy world. Don’t let your allergies compromise your life, health and happiness! Enjoy Life without Allergic Rhinitis!